According to the Sierra Club, they take ten years to disintegrate. Here are a few photos of butts I saw over the weekend on the road behind my home. 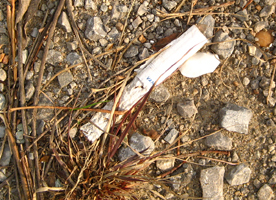 "Illegal Smokes Litter the Ground after Collision"
This headline from the Standard Freeholder in Cornwall, Ontario grabbed my litter eye. The driver of a pick up truck, carrying illegal cigarettes, hit a recycling truck, and cigarettes went everywhere. The story is almost comical. The Royal Canadian Mounted Police seized the illegal cigarettes. My question is what type of illegal cigarettes are they?